ST. GEORGE — Amber Graves simply wants to swim. 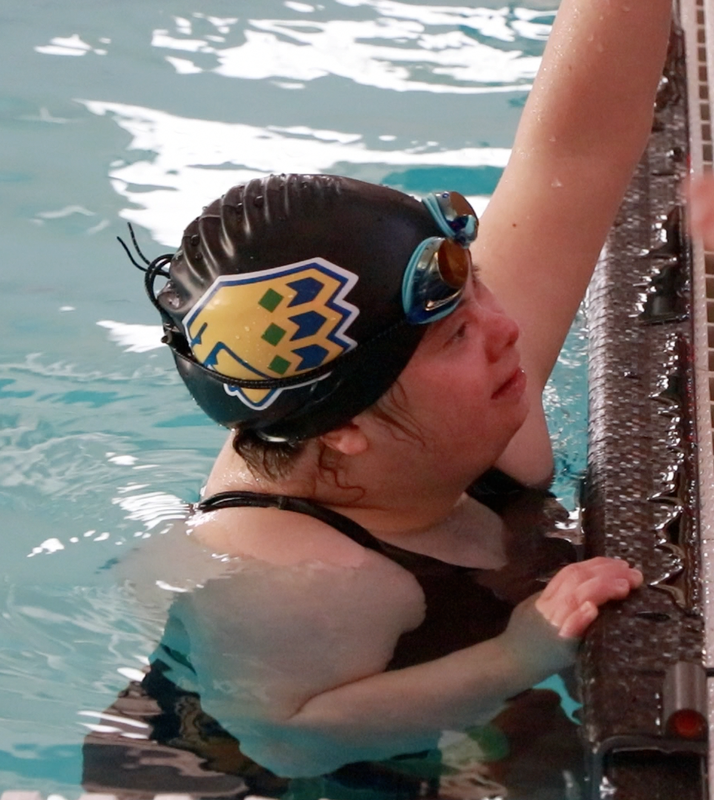 The Snow Canyon High School junior, born with Down syndrome, has been a dedicated member of her school’s competitive swim team for the past three years. Her coach, Tamara Lemmon, says Amber never misses a practice and does whatever her coaches ask of her. “She’s an important part of our team,” Lemmon said. However, due to her disability, Amber often takes twice as long as the fastest finishers to complete a race, even though she works hard to achieve a personal-best time each time she races. Amber specializes in the 50 freestyle, although she has also competed in the 100 butterfly and the 100 breaststroke events. But while Amber has dropped her time in the 50 freestyle this year by several seconds, she’s still 30 seconds away from qualifying for the state meet. However, thanks to the recent efforts of her teammates and coaches, Amber will get the chance to compete at the state 4A championship swim meet in Bountiful Feb. 9-10. Officially, Amber is listed as an alternate for Snow Canyon in the 200 freestyle relay, an event that features four athletes each swimming a 50 leg. Lemmon said she asked the four girls who’d qualified for the relay if they wanted to let Amber swim in the event. Lemmon said the teammates ended up drawing straws at practice this week, with junior Hallie Steel winning the right to give up her spot to Amber. However, freshman Breanna Graves, Amber’s younger sister and one of the other relay team members, hopes to persuade Steel to let her give up her own spot, as Breanna will have more opportunities to compete later in high school than Steel. The other team members – captain Ryleigh Foggin and Melynda Hughes, both also juniors – said they are looking forward to having Amber swim with them and that know it will be a memorable occasion, even if they end up finishing in last place as expected. A similar scenario took place at the Region 9 championships held in Washington City Jan. 27. With Amber as the anchor of the 200 freestyle relay, the Snow Canyon girls finished in last place, but when Amber finished, the crowd cheered as loudly as if they had taken first. 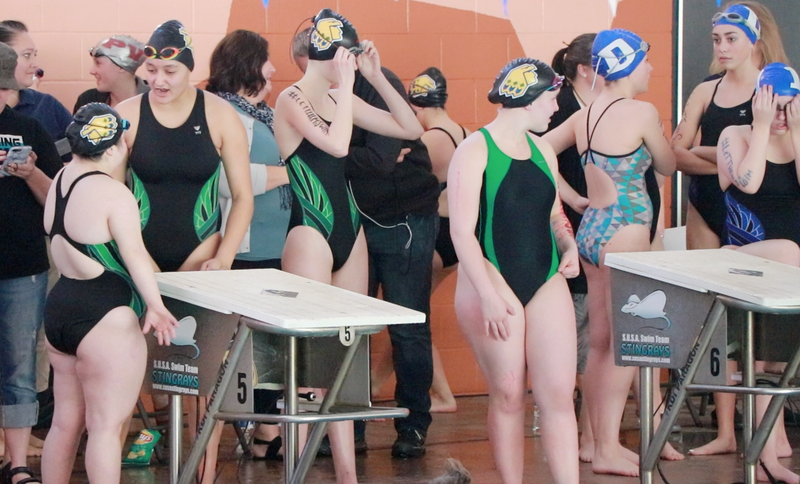 A short time later, a similar wave of applause greeted Amber when she finished her one individual race she entered at region, the 100 breaststroke. “I got a PR,” Amber proudly declared after finishing the breaststroke race and beating her previous personal record. When it comes to the state meet, Lemmon, who also serves as head coach for Dixie High’s swim team, has been working with parents and other coaches trying to incorporate an adaptive heat of the 50 freestyle into the state meet. Lemmon said she knows of several other states that already hold similar events for high school athletes with disabilities and special needs. 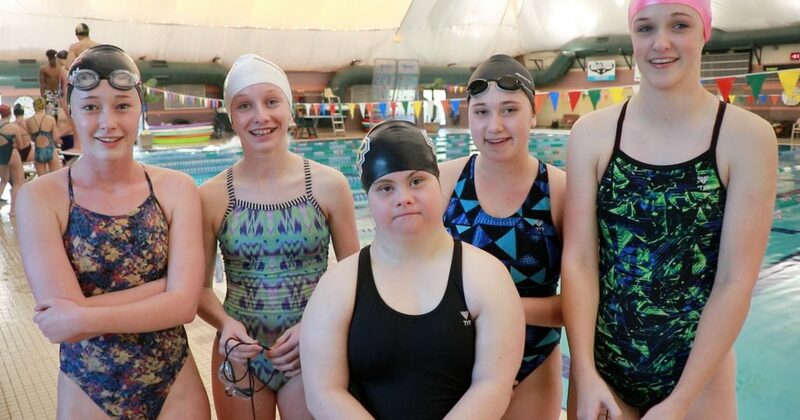 After talking to many other coaches around Utah, she said she has learned of other teams that have special-needs swimmers – including some with disabilities similar to Amber’s and others who are impaired in other ways, such as a missing limb or blindness. Lemmon says her initial inquiry to state meet officials went unanswered for months. Later, after a follow-up email, she was essentially told no and that the state meet was not the appropriate venue for such recognitions. Disappointed and dissatisfied with that response, Lemmon enlisted the help and support of local school administrators, athletic directors and coaches to appeal directly to Utah High School Activities Association officials, who Lemmon said were more receptive. However, UHSAA officials told Lemmon the issue would need to be presented as formal proposal for approval by the UHSAA Board of Trustees. Accordingly, any changes made to the state swim meets would have to wait until next year, as the board doesn’t convene again before this year’s championship events, Lemmon said. In the meantime, Amber’s teammates and supporters hope Amber’s appearance at state next weekend will raise awareness and support for the idea. At the Region 9 meet, Amber’s teammates and many other swimmers began writing #letthemswim in marker on their arms and sharing photos of themselves tagged with that hashtag on social media. In addition, Lemmon and Amber’s mother, Michelle Graves, started a petition at Change.org encouraging people to support the the idea of adding an adaptive race to state. Although they had initially sought to collect 200 signatures, more than 1,850 had signed the online petition as of Friday morning. “To me this is a human rights issue that we need to get behind,” Michelle Graves wrote in a thank you letter distributed to the parents of Snow Canyon and Dixie High swimmers Wednesday evening. Michelle Graves also thanked Amber’s coaches and teammates for their support. 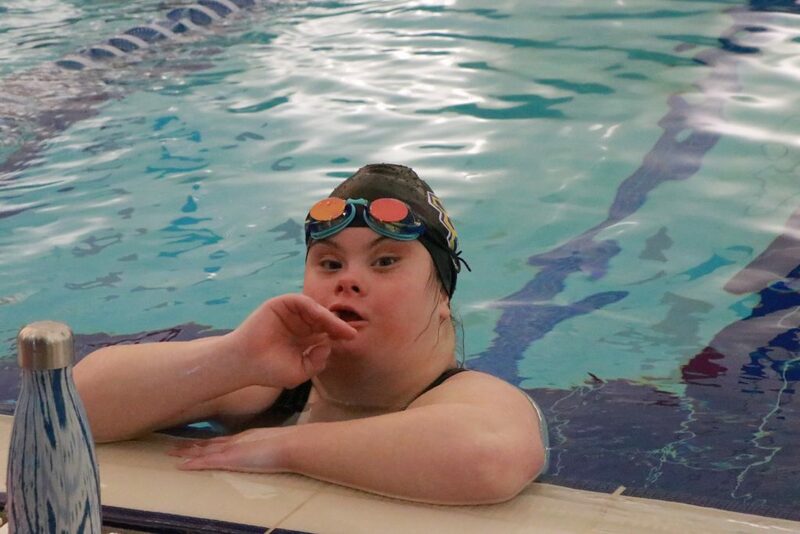 “Although we have made slight adaptations, Tamara has treated her as an equal and has helped her rise to a level of swimming and overall confidence that I never thought she would achieve,” she said. Lemmon said she hopes there will be an adaptive race staged at next year’s state meet, when Amber is a senior.